Background: Emergence of chloroquine (CQ) resistance among different strains of Plasmodium falciparum is the worst catastrophe that has ever perplexed the dedicated efforts to eradicate malaria. This urged the scientists to search for new alternatives or sensitizers to augment its antiplasmodium effect. Materials and Method: In this experiment, the potential of embelin, isolated from Embelia ribes, to inhibit the growth and sensitize CQ action was screened using SYBRE-green-I based drug sensitivity and isobologram assays, respectively. Its effect on red blood cells stability was screened to assess its safety. To explore its molecular mechanism, its effect on plasmodial Hemozoin and the in vitro β-hematin formation was screened as well. Furthermore, its anti-oxidant activity was measured using the conventional in vitro tests and its molecular characters were obtained using Molispiration program. Results: The results showed that its anti-plasmodial effect was weaker than CQ but synergism was obtained when they were combined at ratios lower than 5:5 CQ/embelin. Furthermore, β-hematin formation was inhibited by embelin without showing any synergism after mixing with CQ. Conclusion: Overall, embelin is not ideal to be suggested as a conventional antiplasmodium but it has a potential to ameliorate CQ resistance. Furthermore, its action is not related to its impact on hemozoin formation. Further, investigations are recommended to illustrate its detailed mechanism of action. Chloroquine (CQ) was the most pertinent antimalarial because of its relative safety, cost effectiveness, and efficiency in comparison to other conventional antimalarials. Unfortunately, it started to lose its effectiveness because of emergence of resistance and tolerance among the strains of Plasmodium falciparum. The former reduces drug response to higher doses of the drug whereas the latter increases the prevalence of the disease re-occurrence. This issue urged the scientists to search for other alternatives for malaria treatment or chemo-sensitizers to hinder CQ resistance. 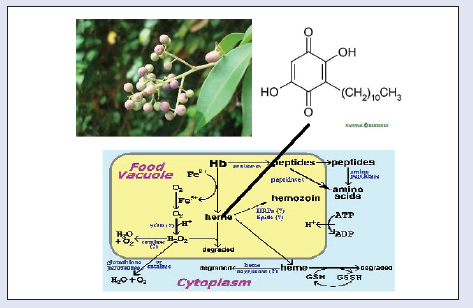 Over the recent past, a trend evolved for introducing phytochemicals in malaria therapy. In this experiment, the potential of embelin as an antiplasmodial agent and CQ sensitizer was studied. Embelin is a natural product obtained from berries of an Ayurveda Indian herb, called Embelia ribes (Primulaceae) and commonly called false black pepper or Vidanga. Previous studies revealed presence of some phytochemicals, viz; embelin, christembine, homoembeline, and vilangin. Embelin is the most abundant among them. Furthermore, the studies showed that the herb has several pharmacological activities, viz; antimicrobial, anti-inflammatory and analgesic. Different compounds act on different intracellular targets within the parasite. Some of them affect targets present in the digestive vacuole (DV), viz; the hemoglobinase system; that is responsible for breaking down hemoglobin into amino acids, or the bio-crystallization pathway that detoxifies heme to the innocuous hemozoin. Other intracellular targets were documented like fatty acid or isoprenoid synthesis pathways, histidin rich protein, or plasmodial protein kinase. Embelin is a quiononoid derivative with a long undecyl side chain. This makes it a lipophilic compound with surface active properties [Figure 1].,, This has behooved us to test its effect on RBCs membrane stability. Furthermore, the quinone nature of the compound suggests presence of an inhibitory effect on hemozoin formation. Human blood group O+ve was donated by the first author and washed thrice with incomplete RPMI-1640 (RPMI-1640, 20 µg/mL gentamicin and 25 mM HEPES) as previously described. RPMI-1640 medium, albumax II, were procured from GibcoBRL (Grand Island, NY, USA). HEPES, Triton X-100, sorbitol, hypoxanthine, (100×) PBS, CQ-diphosphate were purchased form Sigma–Aldrich (St. Louis, MO, USA). Gentamicin was purchased from Jiangxi Dongxu Chemical Technology Co., Ltd. Embelin was purchased from Indofine Biochemical Company Inc. (Cat. No. : E-002). P. falciparum K1 and 3D7, procured from the Institute of Medical Research, Kuala Lumpur Malaysia, was cultured in O+ve RBCs suspended in cMCM (RPMI-1640, 25 mM HEPES buffer (pH 7.4), 0.75 mM hypoxanthine, 0.5% albumax, 24 mM sodium bicarbonate, 11 mM glucose and 50 μg/L gentamicin) (pH 7.4 and Hct = 2%). The incubation was done at 37°C in an atmosphere containing 90% N2, 5% CO2, and 5% O2. [13,14] The culture was synchronized using sorbitol synchronization technique as previously described by Vanderberg. Drug sensitivity screening was done as previously described by Matthias, et al. Drug containing flat bottomed 96 well microtiter plates; featured the triplicate of two folds serial dilution of CQ or embeline (1 nM to 250 µM), were incubated for 48 h at 37°C with an equal volume of parasitized-red-blood-cells (PRBCs). This maximum concentration was chosen because of issues related to embelin's solubility. Control wells, containing drug without RBCs, untreated RBCs (0% parasite growth), and untreated PRBCs (100% parasite growth) were allocated as well. Aftermath, the plates were freeze-thawed and 100 µL of SYBR-green-I lysis buffer (20 mM Tris, 5 mM EDTA, 0.008% saponin, and 0.008% Triton X-100) was loaded to each well. The plates were then left at room temperature for1 h and finally fluorescence was measured after 15 s of plate agitation using Victor Plate reader (Perkin-Elmer, Salem, MA, USA) at an excitation/emission wavelength of 485/535 nm. Finally, both IC50 and IC90 were determined using Microsoft excel 2007 software according to the recommended protocol of percentage of parasite inhibition versus log [drug concentration]. Drug combination assay was done as previously described. Working solutions of each test compound were prepared at concentrations equivalent to 16 times their IC50. This concentration was chosen so as to make the IC50 of each falls in the fourth two fold serial dilution. Aftermath, both working solutions were mixed at (10:0, 7:3, 5:5, 3:7, and 0:10; ratios of CQ/embelin). 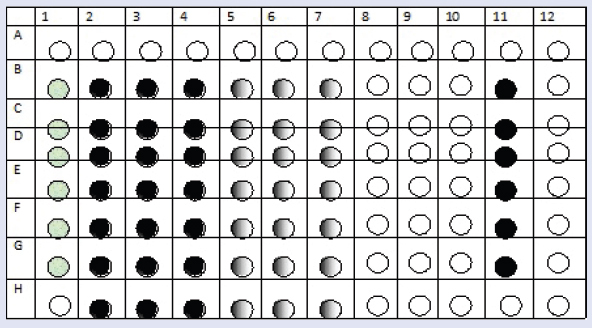 Then 50 µL of each of these mixtures was uploaded in triplicate in row H of the 96 well plate (cells 2–11) and were serially diluted throughout the plate (rows G–B). The peripheral wells were uploaded with 50 µL of the drug, RBCs and PRBCs controls [Figure 2]. Then the plates were incubated at the standard conditions for 48 h and treated as in drug sensitivity assay to determine IC50 and IC90 of each combination separately. Both FIC50 and FIC90 (fractional inhibitory concentration) were calculated from the ratio of the drug's IC50 or IC90 within the combination to those when each test compound was incubated with the parasite alone. Isobolograms were constructed by plotting the IC50 of one drug against the IC50 of the other for each of the four drug ratios, with a concave curve indicating synergy, a straight line indicating addition, and a convex curve indicating antagonism. Different concentrations of embelin(1 nM–250 μM) were incubated with O+ve human RBCs in iCM at 37°C for 48 h. Using 24 well plate (1 mL/cell). After incubation, aliquots of 500 µL from each well were transferred to Eppendrof tube sand mixed thoroughly. They were then centrifuged at 500g for 5 min after which 200 µL of the supernatants were pipetted into flat bottomed 96 well plate. The released hemoglobin was measured at 540 nm (Versa MaxTM). Selectivity index was calculated through finding the ratio of the drug IC50 against plasmodium to that against RBCs and Verocellline. Both physiochemical properties and the predicted bioactivity parameters for embelin were determined using chemi-informatics software known as Molinspiration (http://www.molinspiration.com). It performs a fragment based virtual screening of Log partition coefficient (octanol/water)ClogP or Log P is the logarithm of the partition coefficient of the drug between octanol and water. It is a reference value used in chemistry to designate the hydrolipophilicity of the compound. and polar surface area (PSA). Furthermore, it gives predictive drug-likeness score toward; GPCR, kinase, nuclear factors, ion channels, and protease enzyme. β-hematin formation assay is based on incubating the drug with hemine chloride and monitoring its effect on hemozoin polymerization. Briefly, a solution of 8 mM hemin chloride was prepared using DMSO = Dimethylsulphoxide as a solvent. Then 100 μL of the latter was added to 100 µL of different concentrations of embelin (0.8–40 mM or 0.1–5 molar equivalents of hemin solution) in Eppendroff tubes. Control tubes were treated with distilled water D.W instead of embelin. After math, β-hematin formation was initiated by adding 200 µl of 8 M acetate buffer (pH 5). Then the tubes were incubated at 37°C for 18 h, centrifuged at 3000g and the pellet was collected and dissolved in DMSO. It was re-centrifuged again to get rid of the unreacted hematin; leaving the second pellet which contains the pure β-hematin. At the end, 400 µL of 0.1N NaOH was added to each tube to dissolve β-hematin and 100 µL aliquots of the final solution were transferred to other tubes, diluted 4× using NaOH in the same mentioned concentration and the absorbance was measured using visible light spectrophotometer. CQ in the same concentration range was used instead of embelin as a positive control and absorbance versus concentration curve of embelin was compared with that of CQ. 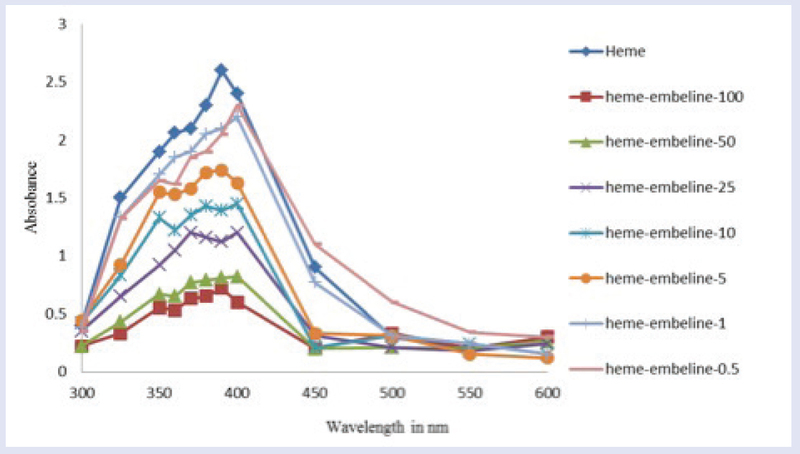 Effect of embelin on Soret band was monitored through scanning the absorbance of the UV-visible spectrum at wavelengths between 300 and 600 nm of heme-embelin mixtures containing 50 µM of hemin-chloride along with 0.5, 1, 5, 10, 25, 50 and 100 µM of embelin. Drug heme interaction is monitored through Job's plot in which the differential absorbance and spectral changes of heme were monitored. A stock solution of 10 µM solution of each of hemin chloride and embelin in DMSO were prepared. A mixture of hemin and embelin (final volume of 100 µL and concentration of both compounds being 10 µM) was prepared. The mixture was buffered using 20 mM HEPES = (4-(2-hydroxyethyl)-1-piperazine-ethan-sulphonic acid) (pH 7.4), incubated at room temperature for 30 min and the absorbance was measured at 388 nm. The differential absorbance was recorded by subtracting the total absorbance of both heme and the drug at 386 nm from that of drug embelin mixture. To assess the effect of the combined effect of CQ and embelin on β-hematin formation, combinations of the two drugs were prepared as previously described but in this time, the mixtures were incubated with hemin chloride solution instead of the alive parasites using Eppendroff tubes instead of the 96 well plates. Furthermore, the working solutions of each were prepared at concentrations equivalent to 16× their IC50 against β-hematin formation not against plasmodial growth. After mixing them at the mentioned ratios (10:0, 7:3, 5:5, 3:7, and 0:10 CQ/embelin), the mixtures were serially diluted 8× using DMSO instead of the cMCM and then to 100 µL of each dilution, 100 µL of 8 mM hemin chloride was added. Aftermath, β-hematin formation was initiated by adding 200 µL of 8 M acetate buffer (pH 5). Finally, the same steps that has been followed in β-hematin formation assay was run for each dilution to determine the effect of each combination on β-hematin formation. This test aims to determine the amount of hemozoin produced by the parasite and how the drugs do affect its formation. It was performed as described by researchers, wherein hemozoin was separated from the cells by filtration using (metrical-membrane-filter) and subjected to pyridine hemochromogen reaction to develop a chromophoric product that is detected spectrophotometrically. Briefly, synchronized trophozoites were incubated with different concentrations of each drug (1 nM–1μM) for 8 h using cell culture suspensions at parasitemia and hematocrit levels of 2%. After incubation, the parasites were harvested and washed 4× with equal volume of 2% Triton X-100; dissolved in D.W. Then the final pellet was dissolved and sonicated in 1 mL 0.05% Triton X-100. The dissolved pellets were then taken up by 1 mL syringe and pushed through a 0.45 μm metrical membrane filter [GN-6 Metricel Membrane, 0.45 µm (non-sterile packages) Pall Corporation]. Aftermath, the filter was soaked in a reaction mixture containing 1N NaOH/Pyridine and D.W (1:2:8 v/v) and the final mixture was divided into two halves. To one, 10 μL of 50 mM of potassium ferrocyanide was added and few crystals of sodium dithionate were added to the other and both were mixed by inversion. Finally, the absorbance of each was measured spectrophotometrically at 560 nm. The amount of hemozoin produced is calculated as following; OD560 = OD560 (reduced sample) − OD560 (oxidized sample). Hemozoin content was expressed in nmol/100 μL of PRBCs. Embelin was cytotoxic to nRBCs (IC50 = 74 µM, IC90 = 322 μM). Unlike CQ, embelin produced a comparable effect on both strains and its action is still considered weak to moderate in comparison to the former [Table 1]. Table 1: Results of drug sensitivity assay for chloroquin and embelin against Plasmodium falciparum K1 and 3D7. Embelin's IC50 and IC90 were in the micromolar while those of CQ were in the nano-molar range. Its cytotoxic effect on nRBCs and poor selectivity to plasmodium made it unreliable to use it at a concentration of 16× IC50 to prepare the working solution of the isobologram. We started the isobologram using embelin at a concentration equivalent to 1× IC50 instead of the 16× IC50. The results shows that embelin produces an additive interaction with CQ against P. falciparum K1 at higher combination ratios (i.e. 7:3/ 5:5 of CQ/embelin) and a slight synergistic interaction at a ratio of 3:7 (CQ/embelin) [Figure 3]. 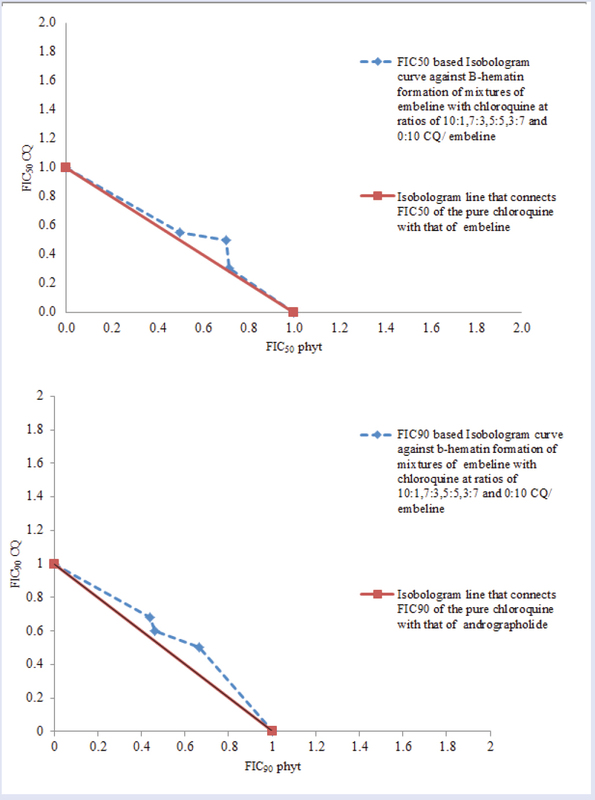 Figure 3: FIC50 and FIC90 based isobolograms (graphs 1&2 respectively)of embelin mixtures with CQ when they were combined at ratios of 7:3, 5:5 and 3:7 (CQ/embelin). They were used at a concentration equivalent to 16XIC50 and 1XIC50 for CQ and embelin respectively. Normally, in the isobologram design, the two drugs should be mixed at ratios of 16 times their IC50 but the hemolytic effect of embelin urged us to use it at lower concentration which was (1XIC50). The straight line represents line of additivity while the broken line represents the FIC50 and FIC90 based isobologram curves. The Molinspiration software is broad range chemoinformatic software provides wide range of information that support molecule manipulation and procession and support the internet chemistry community with lots of free and paid on-line services. It gives full information about the molecular properties (logP, polar surface area, number of hydrogen bond donors and acceptors and others), as well as prediction of bioactivity score for the most important drug targets (GPCR ligands, kinase inhibitors, ion channel modulators, nuclear receptors). shows that it is a lipophilic compound with surface active properties and it has weak effect against most intracellular targets except for nuclear factors [Table 2]. 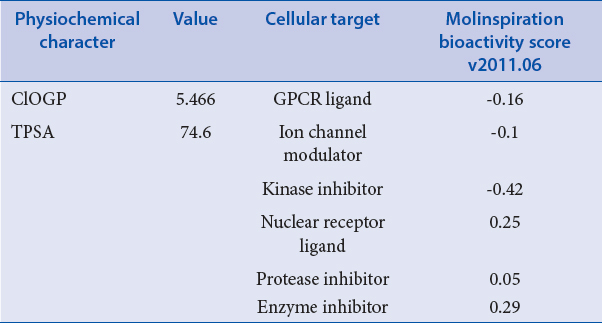 Table 2: Physiochemical properties and the predictive bioactivity of embelin against four main intracellular targets; GPCR, ion channels, kinase, protease and nuclear receptors. The physiochemical parameters include ClogP & PSA,. ClogP represents a global measure of the molecules hydrolipophilicity. PSA (polar surface area) is a measure of the surface area where the polarity is high. Furthermore, it is a measure of the sum of fragments contribution in conferring the polarity. On the other hand, the predictive bioactivity parameters include the drug likeliness score which is a measure of the coincidence of each compound with the standard inhibitors of each of GPCR, kinase and protease enzymes and the nuclear receptors as well as to the standard ion channels modulator. Embelin potency to inhibit β-hematin formation was less than that of CQ (IC50 = 12.3 mM and 53 µM), respectively. It showed heme binding capacity as it slaked down Soret band intensity in a concentration dependent manner [Figure 4]. Maximum complexation was obtained when they were mixed with heme at a stoichiometry of 2:3 heme/CQ and heme:embelin. The figure shows also that embelin tendency to bind to heme is still weaker [Figure 5]. Embelin did not synergize CQ action against β-hematin formation. The isobologram shows that the interaction was indifferent [Figure 6]. Figure 5: Job plot of embelin and CQ binding with heme. The plot shows that their maximum binding with heme occurs at a stoichiometric ratio of 2:3 heme:drug. 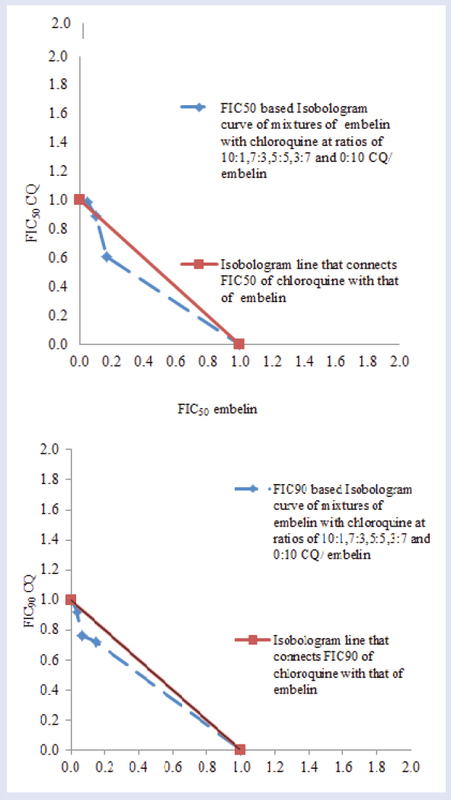 Figure 6: FIC50 and FIC90 based isobolograms (graphs 1&2 respectively) of embelin mixtures with CQ when they were combined at ratios of 7:3, 5:5 and 3:7 (CQ/embelin). They were used at a concentration equivalent to 16XIC50 of the drug against B hematin formation. The straight line represents line of additivity while the broken line represents the FIC50 and FIC90 based isobologram curves. On the other hand, embelin could have inhibited plasmodial hemozoin formation but to an extent quietly less than that of CQ. Less than 10% of hemozoin was inhibited at the maximum concentration used (1 μM). Meanwhile, at the same concentration level, CQ could have inhibited henmozoin formation by about 55%. Embelin is a natural compound isolated from berries of embelia ribes.It has diverse pharmacological effects, such as; antimicrobial, antitumor, anti-inflammatory and analgesic. In this study, its impact on plasmodium growth as well as on CQ sensitivity was screened on P. falciparum K1 and 3D7. Its action against plasmodial growth is still considered weak to moderate as compared with CQ and other conventional anti-malarials. Its IC50 was within the micro-molar range whereas that of CQ was in nano-molar. Furthermore, its selectivity toward plasmodium as compared with RBCs was poor because of its hemolytic effect that might have imparted in its antiplasmodium effect. This can be attributed to its lipophilic and surface active properties (as seen in Molinspiration Simulation software results); which qualify it to accumulate in RBCs membrane and induce their hemolysis. 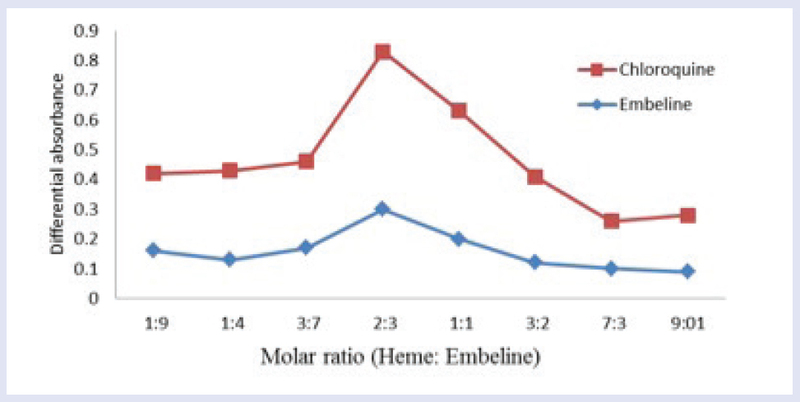 The in vitro study showed that embelin can bind to heme and inhibit β-hematin formation to an extent quiet less than that of CQ [Figure 4]. This intensifies the notion that its action against RBCs membrane may play the pivotal role in its anti-malarial action. Nevertheless, this action opens the door to suggest that embelin may be able to interact with the intra-erythrocytic protoporphyrines resulting in higher chance of RBCs hemolysis. The isobologram technique suggested by Estelle et al. is based on mixing two different drugs at different ratios providing that the two drugs are used at high concentrations reaching to 16× their IC50. Using embelin at such concentration was unreasonable as embelin was cytotoxic at a concentration approaching 2× IC50. This suggests that at higher concentrations most of the action will be attributed to its impact on RBCs rather than its intrinsic effect on the parasite. This behooved us to prepare embelin working solution at a concentration of 1× IC50 instead of the 16× IC50 concentration. Results of isobologram analysis showed that antagonism was absent between CQ and embelin as all the FIC values were <2 [Figure 2]. Antagonism occurs in the presence of any agent that interferes with the access of CQ to the DV or inhibits the CQ induced oxidative stress through moping out the free radicals. On-the-other-hand, embelin synergized CQ at concentrations lower than what had been required to inhibit the growth or affect RBCs stability indicating that its synergistic effect has better selectivity index. This synergism is unlikely to be because of embelin's effect on hemozoin formation as embelin couldn't produce any effect on plasmodial hemozoin formation at this level. Although, embelin had succeeded to inhibit β-hematin in vitro. Furthermore, the study showed that both of embelin and CQ have the same stoichiometry of heme binding indicating that both embelin and CQ act on the same target sites when they inhibit hemozoin formation. Its failure to inhibit plasmodial hemozoin at the concentrations wherein the parasite growth was affected without affecting RBCs integrity (concentrations less than 80 μM) suggests that embelin has produced its antiplasmodium effect or synergized CQ action using a mechanism different from targeting hemozoin formation. Furthermore, the results suggest also that to target hemozoin, higher concentration of embelin is required that may hit to its cytotoxic threshold on RBCs. Drugs may synergize CQ through enhancement its intra-vacuolar accumulation or intensifying CQ induced cell apoptosis signal. The former action is triggered by drugs that alter the transport mechanisms which mediates influx and efflux of CQ throughout the DV membrane. Two types of transport mechanisms were found; pfmdr (P. falciparum multidrug resistance) and pfcrt (P. falciparum CQ resistance transporters). They mediate CQ entry and exodus outside the DV, respectively. Drugs that trigger the former can synergize CQ action by triggering its intra-vacuolar accumulation., On the other hand, it was found that CQ does not merely inhibit the intra-vacuolar formation of hemozoin, its intra-vacuolar accumulation may wrench the DV membrane stability resulting in leakage of the intra-vacuolar content into the cytosol resulting in propelling the cascade of the CQ induced apoptosis signal. The apoptotic signal starts with distortion of the mitochondrial membrane integrity, loss of the mitochondrial membrane potential and leakage of the mitochondrial components of free radicals and cytochrome C. This is followed by activation of the caspase system which starts breaking the cellular components and induces cellular shrinkage. Embelin lipophilicity candidates it to act on both pathways as its lipophilicity qualifies it to accumulate in the DV membrane resulting in alteration of the pfcrt functional properties. Previously, it was found that pfcrt function is highly correlated with the membrane potential and integrity of the DV membrane. On the other hand, embelin's physiochemical properties may also entitle it to accumulate in the mitochondrial membrane and intensify the CQ induced apoptosis signal. Further studies are recommended to confirm the reliability of this notion. Molinspiration's bioactivity predictive tool showed that embelin has a relatively weak effect on some targets, viz; GPCR, kinase enzymes, and ion channels but it was stronger on nuclear factors. This may be because of its higher lipophilicity that entitles it to cross the nuclear membrane and bind to nuclear receptors. Nevertheless, all of these actions were suggested on human cells and further studies are recommended to explore them in the parasite. It is noteworthy that its synergy was more obvious in the FIC90 based isobologram rather than the FIC50 based one suggesting that its potential to inhibit CQ tolerance is higher than its effect on CQ resistance. Overall, embelin is not an ideal antimalarial compound because of its poor selectivity to plasmodial cells. It can be considered as a good CQ resistance reversing agent but further studies are required to optimize its safety and the effective In vivo concentration to achieve this effect as our in vitro study suggests that its implementation is accompanied with the haphazard of RBCs hemolysis. It is unlikely that this action occurs because of its effect on the DV and further studies are required to elucidate its molecular mechanism. The work is supported by Universiti Putra Malaysia Research Grant (GP-IPS/2014/9438728). Trape J. The public health impact of chloroquine resistance in Africa. Am J Trop Med Hyg 2000; 64(suppl):12-7. Witkowski B. BAB-VF. Resistance to antimalarial compounds: Methods and applications. Drug Resist Updat 2009;12:42-50. Stephanie G. Valderramos, J.C. M., Lise purcell, lisa A. Mercereau-puijalon, Odile legrand, Eric fidock, et al. 2010. Identification of a Mutant PfCRT-Mediated Chloroquine Tolerance Phenotype in Plasmodium falciparum. PLoS Pathogens, 6:e1000887. Maud Henry SA, Eve Orlandi-Pradines, Hervé Bogreau, Thierry Fusai, Christophe Rogier, Jacques arbe, et al. Chloroquine resistance reversal agents as promising antimalarial drugs. Curr Drug Targets 2006;7:935-48. Debebe Y. T. Mesfin mekonnen, Walelign abebe, dawit woldekidan, samuel abebe, et al. 2015. Evaluation of anthelmintic potential of the Ethiopian medicinal plant Embelia schimperi Vatke in vitro and in vitro against some intestinal parasites. BMC Complementary and Alternative Medicine, 15:187. Nikolovska-Coleska Z1 XL, Hu Z, Tomita Y, Li P, Roller PP, Wang R, et al. Discovery of embelin as a cell-permeable, small-molecular weight inhibitor of XIAP through structure-based computational screening of a traditional herbal medicine three-dimensional structure database. J Med Chem 2004;47:2430-40. Olliaro PL YY. An overview of chemotherapeutic targets for antimalarial drug discovery. Pharmacol Therap 1999;8:91-110. Vanderberg JP. La. synchronization of Plasmodium falciparum erythrocytic stages in culture. J Parasitol 1979;65:418-20. Matthias G. Vossen SP, Peter Chiba, Harald Noedl. The SYBR green I malaria drug sensitivity assay: Performance in low parasitemia samples. Am Soc Trop Med Hyg 2010;83:389-401. Quinton L, Fivelman ISA, David CW, Modified fixed-ratio isobologram method for studying in vitro interactions between atovaquone and proguanil or dihydroartemisinin against drug-resistant strains of Plasmodium falciparum. Antimicrob. Agents Chemother 2004;48:4097-102. Silvia Parapini NB, Erica Pasini, Timothy J. Egan, Piero Olliaro, Donatella Taramelli, et al. Standardization of the physicochemical parameters to assess in vitro the b-Hematin inhibitory activity of antimalarial drugs. Exp Parasitol 2000;96:249-56. Auparakkitanon S. CS, Kuaha K, Chirachariyavej T, Wilairat P. Targeting of hematin by the antimalarial pyronaridine. Antimicrob Agents Chemother 2006;50:2197-200. Wanida Asawamahasakda II, Chih-Ching Chang, Peter McElroy, Steven R. Meshnick. Effects of antimalarials and protease inhibitors on plasmodial hemozoin production. Mol Biochem Parasitol 1994;67:183-91. J. Shelnutt. Metal effects on metalloporphyrins and on their π - π charge-transfer complexes with aromatic acceptors. Inorg Chem 1983;22:2535-44. Huang CY. Determination of binding stoichiometry by the continuous variation method: the Job plot. Methods Enzymol Part 1982;87:509-25. Sidhu A, Verdier-Pinard D, Fidock D. Chloroquine resistance in Plasmodium falciparum malaria parasites conferred by pfcrt mutations. Science 2002;298:210-3. Zaid O Ibraheem RA, Sabariah MN, Hasidah MS, Basir R. Role of different pf mdr-1 and pf mdr-1 mutations in conferring resistance to antimalaria drugs in Plasmodium falciparum. Mal Res Treat 2014;2014: http://dx.doi.org/10.1155/2014/950424. J-H Ch'ng KL, AS-P Goh, Sidhartha E, Tan KS-W. Drug-induced permeabilization of parasite's digestive vacuole is a key trigger of programmed cell death in Plasmodium falciparum. Cell Death Dis 2011;2:e216. Estelle S. Zang-Edou UB, Zacharie Taoufiq, Faustin Le´koulou, Jean Bernard Le´kana-Douki, Yves Traore, Dominique Fousseyni S. Toure´-Ndouo, et al. Inhibition of Plasmodium falciparum field isolates-mediated endothelial cell apoptosis by Fasudil: therapeutic implications for severe malaria. PLos One 2010;5:e13221.